High Quality Content by WIKIPEDIA articles! 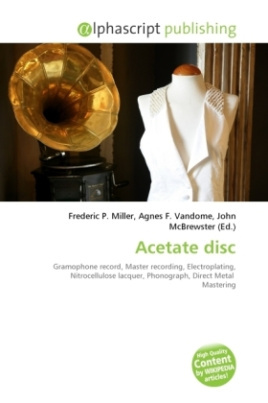 An acetate disc (also known as a test acetate, dub plate, lacquer, or transcription disc) is a type of mechanical sound storage medium closely related to the gramophone record and it's manufacturing process. Acetates are typically produced from a master t ape recording. By electroplating the acetate master, stampers (special moulds) can be created, which in turn are used to press large quantities of records. Acetates are also used for testing the quality of the tape-to-disc transfer. A typical acetate disc is an aluminum disc, 10 or 12 inches in diameter, that is covered with a thin coating of nitrocellulose lacquer in which the sound groove is cut. Discs of this type can be played on any normal phonograph, but wear out very quickly. Some acetates are highly prized for their rarity.